evenings are getting longer with Summer just around the corner. Some of you may read – Wellington Weekly, Tiverton Gazette or Culm Valley Gazette. There was a report in these papers about Snowdrift, but GSL Andy has asked me to mention the activity here. Snowdrift has been part of Hemyock scouts for many a long year as I mentioned last time. Our young people did well back at the beginning of February. They braved the elements to sleep under the stars with no tents and very little equipment. Matt, our Explorer leader was with his team and some of the older scouts who will be joining the Explorers in the near future. They started on Saturday morning by heading up to a friendly farmers patch of woodland (many thanks to him). There they had what is described as “yummy” porridge. Must have been good! Ever onward – next a five mile hike to the campsite which was an area in Blackborough Woods. Having built shelters, they ate well on rabbit and swede cooked over the camp fire. It was a cold and a bit wet night but some sleep was achieved. Next day, having left the site as they found it, it was time to head home and much deserved showers and baths. Well done to all of them and those who helped in the running and planning. The spirit of Snowdrift is alive and well. I am sure they are looking forward to next year. Meanwhile Spring programmes continue for all sections. With an eye on the summer and camps! Moving on. St Georges Day Parade and Service. 22nd April. 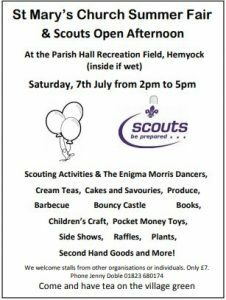 This will be the fifth year that we have been with you in Hemyock (prior to that we attended the District event in Tiverton). 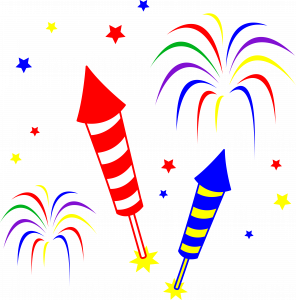 We will gather at the Parish Hall for the Parade at 10.00am to St Marys and the service. As some of you may know Old Rikki says a few words during the service. This year will be quite active. Everybody can be involved if they want to. Doing what? You will have to join us to find out. After the Service we go down to The Garages for our AGM. You are very welcome to join us and perhaps become a member of our Group Executive, we are always looking for new input. That is about it for this time but for BP’s finally. This is from camp fire yarn no:4. The Patrol system. A word to patrol leaders from Baden Powell. I want patrol leaders to train your patrol entirely yourselves, because you know them and can make good fellows of all of them. It is no good having one or two brilliant fellows, you must try and make all of them fairly good. The most important step to this is your own example because your chaps will follow that example. But remember you must give them the lead and not the push. Rikki thinks that that is still pertinent today and always will be. October. 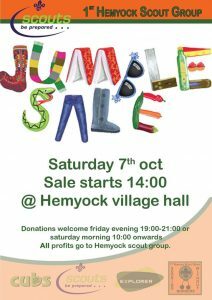 Our famous Annual Sale in the Parish Hall. Do you buy from Suttons Seeds? 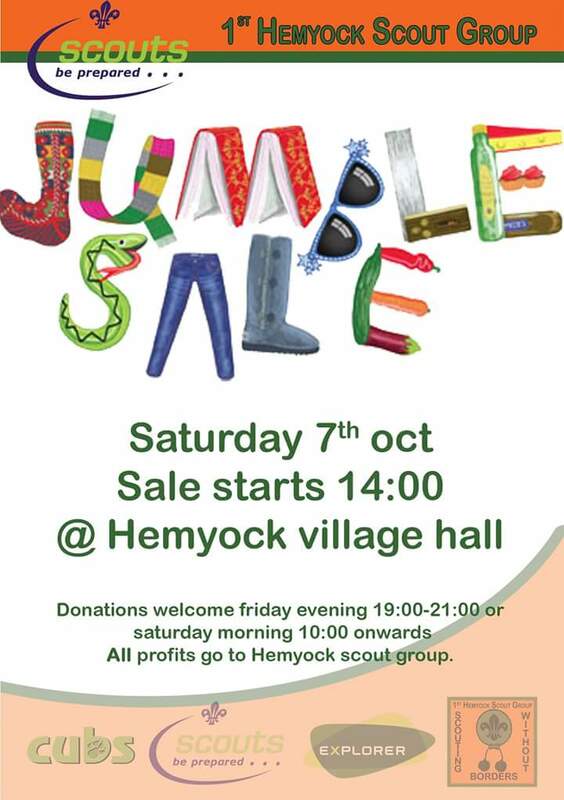 Seeds while also raising money for Hemyock Scout Group. in earlier Pumps this year that my dear old friend Ronald was battling with cancer. Alas his struggle ended in August. As I have said he was the first assistant Scout Master with 1st Hemyock back in 1961 and has followed the scout principles for the rest of his life. May he now rest in peace. Onward, we are now into our Autumn programmes. We have reports from the group. Explorers: currently eleven members of which eight went to summer camp in the Peak District. Scouts: twenty eight members. Fifteen went to camp with the Explorers. Andy reports that the camp was a great success. The site at Barnswood was well wooded, which suited Hemyock with lots of wood for open fires every night. Activities included canoeing, caving, an 80ft abseil, a trip to Alton Towers and a hike to the top of Kinder Scout. In Autumn term a camp at Forest Glade plus all the usual outdoor activities and finishing with a Christmas party in a field at Deep Sellick Farm, thanks to Wendy and Edward Grabham. running the sports day and district cub camp. As you can see we are a very busy and active group. Our leaders our doing a super job. Akela Julie is also Training Manager for the District. Steve is also giving time to help with Dulverton group. Josh and Andy are new cub leaders. I will blow our own trumpet. Is it any wonder that we are probably the best group in District? Well done GSL Andy, his leaders and of course the young people who are members of the Group. We have a cub waiting list– but we are working on that! running the Group. We currently need new tents for the cubs and as you can imagine– they aint cheap! Our annual bonfire and burger night will be in November. 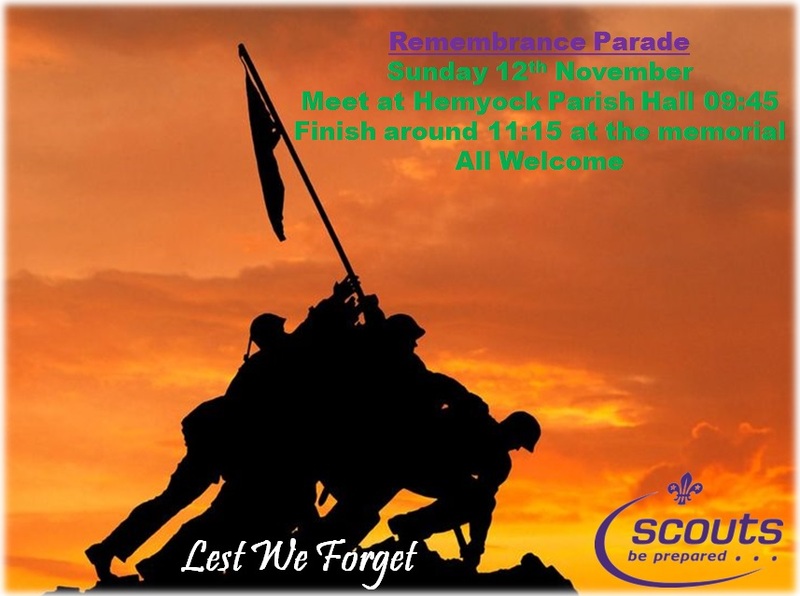 Day Parade and Service on 12th November. And finally, well actually two ! First. GSL Andy has caught the Danish bug. He is currently wearing a kilt, I believe for a year! I did not notice a sporran when I saw him recently. Anybody got a spare one? And now from Baden Powell. Camp Fire Yarn No.3 Tests. The Scout Promise. A difficult promise to keep, but it is a most serious one and no young person is a scout unless they do their best to keep it. When you promise on your honour to do a thing you must do your utmost not to break it. So you see Scouting is not only fun but also requires a lot from you and I know that I can trust you to do everything you possibly can to keep your Scout Promise. As said by Baden Powell,our Founder.